An early and excellent entry in the William canon. Like P.G. 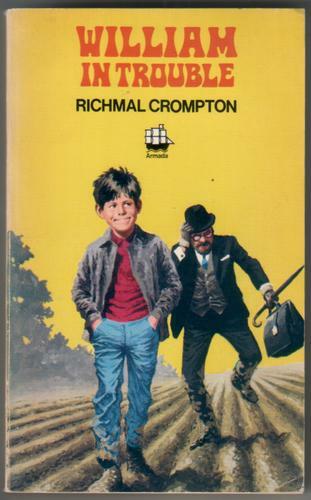 Wodehouse and J.P. Martin, Richmal Crompton is an author who inspires me to ration myself. I stop myself reading too much at one sitting, because it’s easy to be greedy when the pleasure of reading is so great. But it’s the prose and the playfulness of Wodehouse and Martin that are pleasurable. Their writing is so light and inventive that it makes me feel happy just to read it. That’s from “William’s Truthful Christmas”, in which William is inspired by a Christmas sermon to “cast aside all deceit and hypocrisy” and speak only the truth. The consequences are predictable: William does what he always does and introduces chaos into the well-ordered and well-regulated adult world. He might be small in stature, but he’s big in influence. Anyone who knows William will also know that “sweet” is not the mot juste, but Mrs. Brown always tries to see the best in her children. She represented calm and William represented chaos in 1925, when this book was first published, and they still represented calm and chaos forty-five years later in 1970, when William the Lawless, the last William book, was published. They never aged and their world never took on any more solidity. Geography and landscape didn’t interest Crompton: character and dialogue did. William is one of the best characters in children’s literature and he’s at his best here. But today he’s no longer at his most popular. That’s why I’m glad that my copy of Still William is older than I am. My battered hard-back was awarded as a prize in 1951 to “Michael Weatherill” at the Jesmond Road School, overseen by the “West Hartlepool Education Committee”. He won it for “Perseverance”, which is very appropriate. William perseveres, always trying to extract fun and excitement from an often difficult world. Fun isn’t guaranteed, but excitement always is. Without William, life would be duller for both his fictional family and his fiction’s fans. Some of the Biggles short stories, particularly those set during the First World War, are excellent and inventive literature. The Biggles novels, on the other hand, are usually formulaic pot-boilers. Reading them can be like watching the same play over and over again with different scenery. That’s certainly true of the four novels collected here: Biggles in the Baltic (1939), Biggles Sees It Through (1940), Biggles Flies North (1941) and Biggles in the Jungle (1942). Each has the same plot: Biggles and his comrades Algy and Ginger face a ruthless and cunning enemy, are captured and imprisoned, escape, and ultimately triumph. Sometimes they’re captured and escape more than once. Little else varies but for the landscape, the name of their enemy and the nature of his ruthlessness and cunning. In Biggles in the Baltic and Biggles Sees It Through it’s the Nazi Von Stahlhein; in Biggles Flies North it’s a crook called Brindle McBain and in Biggles in the Jungle it’s a crook called The King of the Forest. I’ve never managed to finished Biggles in the Baltic, because it’s so dull. There’s little memorable in any of the others apart from a bar scene in Biggles Flies North in which McBain puts a bullet through Biggles’ cup of Bovril and Biggles puts a bullet through McBain’s bottle of whiskey. All the same, reading the middle two novels of this collection has been one of the most interesting literary experiences of my life, because I carried out a simple experiment I’d been meaning to try for some time. What did I do? I read the the novels upside-down. That is, they were upside-down, not me. I simply turned the book through 180° and read the lines of text right-to-left and from the bottom of the page to the top. It was hard work: from being a fluent, fast and careless adult reader I was transformed into a slow and stumbling learner again. I had to spell some words through letter by letter. I made mistakes and jumped to wrong conclusions about the word I was trying to decipher. It was hard work and the stories were a lot more interesting than they would have been if I’d read in the usual way. They were also more frustrating: when Biggles & Co. were captured or otherwise in difficulty, I couldn’t get to the bits where they escaped or overcame the difficulty as quickly as I wanted to. And I was much more aware of the act of reading – its strangeness and its power. Or perhaps you could just say that I was aware of the act of reading. It wasn’t easy and automatic any more. But it might have become so if I’d continued the experiment for long enough. 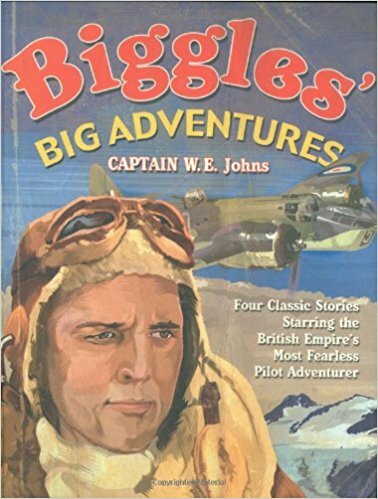 My skill at upside-down reading improved even over the course of two Biggles novels. Something was happening inside my brain: I was re-learning to see words as Gestalts and not as sets of individual letters. Would I ever read upside-down as easily as I normally do? In time, perhaps. I doubt I’ll ever try to find out, but it was certainly an interesting experiment and I may try it again if another suitable book comes my way. When I picked up my second Asterix book as a child, I opened it and then put it down again. I thought I had read it before, because it had the same first page: a map of Gaul, transfixed by a Roman eagle but with a magnifying glass on one small unconquered corner in the north-west, the Gaulish village where the pint-sized warrior Asterix lives with his giant friend Obelix. After I picked up another book in the series, I realized my mistake. The Asterix books all had that first page. Now I realize something more: that the map is important not just to set the scene but also to assuage the humiliation. The Asterix books are ostensibly about clever Gauls getting the better of clumsy Romans, with the Gauls standing in for children and the Romans for adults. But they’re also about the French and the Germans during the Second World War. In fantasy, the Gauls managed to keep one corner of their homeland their own, fighting off and humiliating the Romans every time they tried to conquer it. In reality, France was entirely conquered and the French were the humiliated ones. The German occupation was no joke. The Roman occupation could be, though. 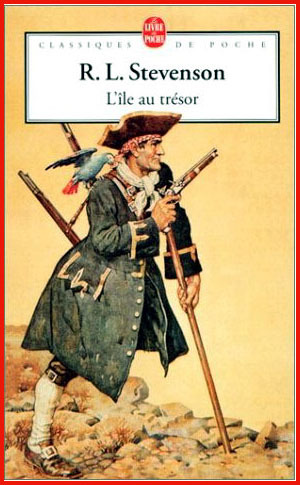 After all, it took place many centuries before Le Tour de Gaule d’Asterix was first published in 1967, when the German occupation was still a vivid memory for millions of French. Asterix was a salve for the psychic wounds of a nation, but its pharmacological recipe works outside l’Hexagone. * The bright colours, constant action, chaotic plots, and visual and linguistic puns of Asterix will make you feel cheerful whether or not you’re French. And whether or not you read them in French. But reading in French is best, of course. As I’ve said before, if you’re learning a language you should do two things: use a monolingual dictionary and read comics. With comics, you see language illustrated by action and objects, so you absorb meaning without your mother-tongue getting in the way. 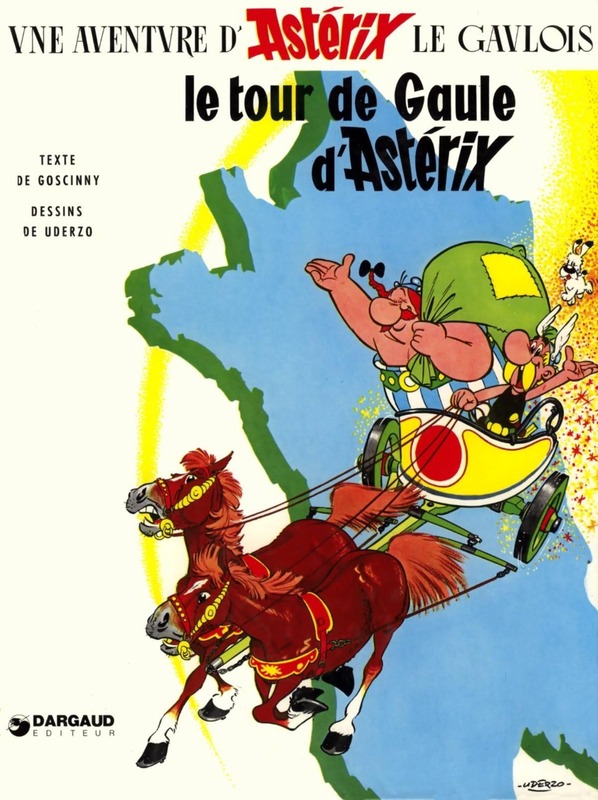 That happens all through Le Tour de Gaule, which is about a bet Asterix has with a Roman prefect called Lucius Fleurdelotus, who has been sent by Jules César to stop Asterix and the other villagers disturbing the “paix Romaine” of Gaul. Lucius has had the village surrounded by a palisade of stout wood and tells Asterix from a watch-tower that he and the other villagers will have to stay on their own small piece of land and be forgotten. Asterix defiantly disagrees: “ROMAIN! NOUS SOMMES CHEZ NOUS EN GAULE ET NOUS IRONS OÙ BON NOUS SEMBLERA…” – “Roman! Gaul is our home and we’ll go wherever we please…” He bets Lucius that the palisade will prove useless and that he, Asterix, can go on a tour of Gaul, gathering the culinary specialities of every region for a banquet to which Lucius is formally invited. They set off, but the horse begins to tire very quickly. Then it begins raining. “NOTRE CHEVAL A DÉTEINT!” gasps Asterix: “Our horse has changed colour!” And one of the chariot’s wheels falls off. They’ve been sold a ringer: the horse was painted black and the chariot unfit for the road. But it doesn’t stop the Tour. They simply commandeer the Roman char de dépannage, or “pick-up chariot”, that arrives to tow away their wreck. There are lots more new jokes before the end of the book, plus the running gag that sees them meet a long-suffering pirate ship in the Mediterranean. And Obelix, as usual, reacts badly to the suggestion that he’s fat. Because images accompany the action, I understood most of the French easily, but there were puns and regional jokes that went over my head. I didn’t understand the end of the book either, when Asterix gives Lucius the village’s own speciality: “LA CHÂTAIGNE!” – “The chestnut!” As he says it, he knocks Lucius – TCHAC! – right out of his sandals and high into the air. That couldn’t be translated literally into English and a lot must be lost when you read Asterix in another language. But the images remain and sometimes the translation works better than the original. The village druid Panoramix is called Getafix in English, the rotund village chief Abraracourcix is Vitalstatistix, and the caterwauling village bard Assurancetourix is Cacophonix. Cacophonix would work in French too, but those names are a rare example of an outsider improving on the original. In their way, the Asterix books are one of the great products of French civilization, full of charm, cleverness and joie de vivre. I don’t think anything could make them more enjoyable, but that subtext about the German occupation makes them more interesting. *“The Hexagon”, as France is known because of its roughly six-sided shape on the map. When I first read this as a child, I didn’t realize that it was one of the strangest books ever written. I do now. And the strangeness was heightened by the old edition I’ve re-read it in, because it came as a double volume that started with Kingsley’s The Heroes, or Greek Fairy Tales (1856). No-one reading The Heroes would guess what awaited them in the second half of the book. The prose plods, the imagery is strictly conventional – “Then Aietes’ rage rushed up like a whirlwind, and his eyes flashed fire” – and Kingsley makes interesting stories dull. I quickly gave up when I tried to read them. [It] had been built at ninety different times, and in nineteen different styles, and looked as if somebody had built a whole street of houses of every imaginable shape, and then stirred them together with a spoon. For the attics were Anglo-Saxon. The right wing Pure Doric. The left wing pure Boeotian, which the country folk admired most of all, became it was just like the new barracks in the town, only three times as big. The grand staircase was copied from the Catacombs at Rome. The cellars were copied from the caves of Elephanta. The offices from the Pavilion at Brighton. He turns on it angrily, then realizes it’s his own reflection in a “great mirror, the like of which [he] had never seen before.” For the first time in his life, he understands that he is dirty. The knowledge startles and shames him, so he tries to flee up the chimney. But he upsets the fire-irons and wakes the little girl. She screams, thinking he’s a thief; and Tom’s adventures begin. He leaves the little girl’s bedroom by the window, climbing down the magnolia tree outside, and runs off. Soon the whole house and its staff are chasing him, but he tricks them off his trail, “as cunning as an old Exmoor stag”, and makes off through a wood, then onto the hills of a moor. After the grand catalogue of architectural styles, Kingsley’s descriptions become detailed and naturalistic: “[Tom] saw great spiders there, with crowns and crosses marked on their backs, who sat in the middle of their webs, and when they saw Tom coming, shook them so fast that they became invisible.” But when he disturbs a grouse washing itself in sand, it runs off and tells its wife about the end of the world. Like Tom, the reader has entered a new world where animals think and talk. He’s now a Water-Baby and can begin his amphibious adventures. As the title suggests, water is central to this book: it’s a protean, ever-changing medium, with the power to transform, transport and cleanse. And it has a lot in common with language, which is also protean and transformative. And then there came by a beautiful creature, like a ribbon of pure silver with a sharp head and very long teeth; but it seemed very sick and sad. Sometimes it rolled helpless on its side; and then it dashed away glittering like white fire; and then it lay sick again and motionless. That’s a description of an oar-fish, I think. When Tom finds the Water-Babies of whom it spoke, he completes his moral education under the guidance of two mother-fairies, the ugly Mrs. Bedonebyasyoudid and the beautiful Mrs. Doasyouwouldbedoneby. But the ugly can become beautiful: Kingsley was a Christian and this is a moralistic story too. The dirt that Tom has to lose is spiritual, not just moral and physical: he saw a crucifix in the little girl’s bedroom and didn’t know what it was. But there’s too much going on in The Water-Babies for any simple reading of Kingsley’s aims. Or perhaps I’m saying that because I’m not a Christian. Either way, the book certainly isn’t conventional in its Christianity. Like C.S. Lewis’s Narnia or J.R.R. Tolkien’s Middle-earth, Kingsley’s world is big enough for non-believers. But it isn’t as coherent as Narnia or Middle-earth, or as easy to enter as Wonderland. That’s part of why The Water-Babies isn’t as famous or as widely read today. Lewis Carroll played with both logic and language; Kingsley plays with both life and language. That’s what I like about this book. You’ll find vivid little naturalistic touches like spiders shaking in their webs and words like “Necrobioneopalaeonthydrochthonanthropopithekology”. 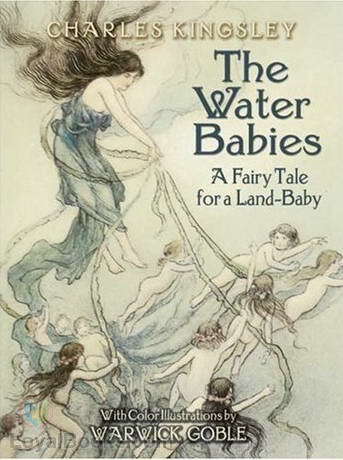 If Charles Dickens and Lewis Carroll had collaborated on a book, it might have ended up something rather like The Water-Babies. And James Joyce would have been good as a collaborator too. I don’t know if he was influenced by The Water-Babies, but he could have been. He too was obsessed with language and water. Both of them are at the heart of this Fairy Tale for a Land Baby. Reading a book in childhood is like visiting an island. You land, you explore, you sail away. That’s when the island starts to sink. Sometimes it sinks quickly, vanishing beneath the sea, swallowed into the subconscious. 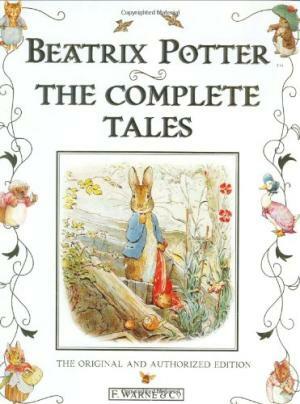 I’ve completely forgotten a lot of books I read in my childhood. But sometimes a literary island sinks slowly and incompletely, leaving reefs and outcrops. A powerful story can stay with you for life. 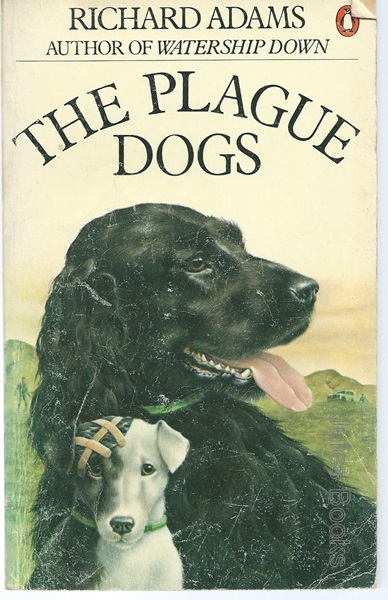 The Plague Dogs was like that for me. It’s a long time since I last read it, but parts of it had stayed with me, never sinking into the subconscious. Things that never sank included the sounds and smells of experimental pigeons in a darkened laboratory and old Tyson’s “R.N.K. theory” about the origins of their homing instinct: “Reckon nobody knaws” (pg. 28). Other parts weren’t far underwater and I remembered them as I read, like the monkey kept isolated in a tank until it becomes catatonic. But some of it had sunk beyond recall, like the fox who meets Rowf and Snitter, the dogs of the title who have escaped from a research laboratory in the Lake District. Why did I remember the pigeons and forget the fox, when the pigeons are gone in a couple of pages and the fox – “the tod” – is there chapter after chapter, behaving and talking in a highly memorable way? Tod smells memorable too, particularly to a dog: Snitter and Rowf think that he has a “wild” and “exciting” smell, “a sharp, killing smell, a furtive smell, trotting, preying, slinking through the darkness” (pg. 92). Like Adams’ much more famous Watership Down (1972), this book is good at invoking the sensory world of animals and making you experience the world through their eyes, nose and ears. But Watership Down is much more famous partly because it’s a much better book. It also has an uplifting theme, not a upsetting one. It’s about animals finding new lives, not animals being tortured in the name of science. And for me the island of Watership Down never sank beneath the waves, because I’ve never stopped re-reading it. 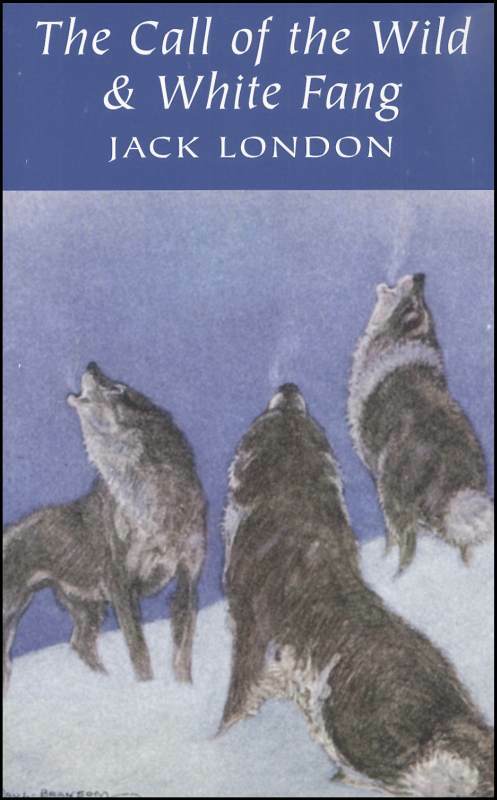 It’s a strange, haunting and beautiful book, with more seasons and fewer humans in it than The Plague Dogs. It has more landscapes too. The Plague Dogs takes place from Friday 15th October to Saturday 27th November in the bleak landscape of the Lake District: hills, stones, tarns and occasional trees, as described by Adams and drawn by Alfred Wainwright. The drawings are usually better than the text, because they aren’t experimental or extravagant. Adams has one big experiment in Watership Down and it works: the invention of Lapine, the rabbit-language. Like Lovecraft’s Cthulhu and R’lyeh, Adams’ Thayli and Hlao-roo are anti-anthropocentric, loosening the mind’s hold on the familiar, making us think from a new perspective. Passages like that remind me of what Housman says about Swinburne’s attitude to literature: “he dragged this subject into the midst of all other subjects, and covered earth and sky and man with the dust of the library”. Adams knows a lot about literature, but doesn’t always know how to wear his knowledge lightly. He tries to imitate Dickens too: he crowds the book with characters, many of them supposed to be grotesque, like Digby Driver, an amoral crusading journalist, and Bernard Bugwash, the M.P. for Lakeland Central. But few of them come to life: he doesn’t have Dickens’ vivificative powers. Rowsby Woof is “the most objectionable, malicious, disgusting brute that ever licked a man’s hand”, and he’s rightly deceived by El-ahrairah’s lies about Queen Dripslobber and her two “noble attendants, the fairies Postwiddle and Sniffbottom”. But Adams isn’t expressing his own disdain for dogs: he’s expressing the disdain of rabbits in the story. I realized that when I read The Plague Dogs. It doesn’t satirize dogs, it sympathizes with them. Unfortunately, I’m still with the rabbits. I don’t like dogs and I don’t think this book is half as good as Watership Down. But its flaws make it interesting and it captures something of the Lake District and something of England in a vanished era, the 1970s. And if you like dogs, you’ll probably like it more than me, because there is a happy ending. It’s a clever domestic touch amid the horror that has gone before and the horror that is to come. But Treasure Island is full of touches like that, bringing the world of the story before the mind’s eye or ear or nose: the notch in the “big signboard of Admiral Benbow”, left by Bill’s cutlass as he aims a blow at Black Dog; the “five or six curious West Indian shells” in Bill’s sea-trunk and the “piece of pigtail tobacco bitten away at the end” in his pocket; the “smell of sodden leaves and rotting tree trunks” at the Hispaniola’s first anchorage; the death-shriek that sends marsh-birds whirring aloft when a loyal sailor is murdered; O’Brien’s red cap floating on the surface and the baldness of his bare head beneath the rippling water; Long John Silver’s parrot’s “pecking at a piece of bark” in the dark; the “wood ash” on the black spot handed to Silver, which soils Jim’s fingers; the “heavy-scented broom and many flowering shrubs” on Spy-glass Hill; the grass sprouting on the bottom of the “great excavation” where Flint’s treasure had been; the “strange Oriental” coins “stamped with what looked like wisps of string or bits of spider’s web”; and many more. 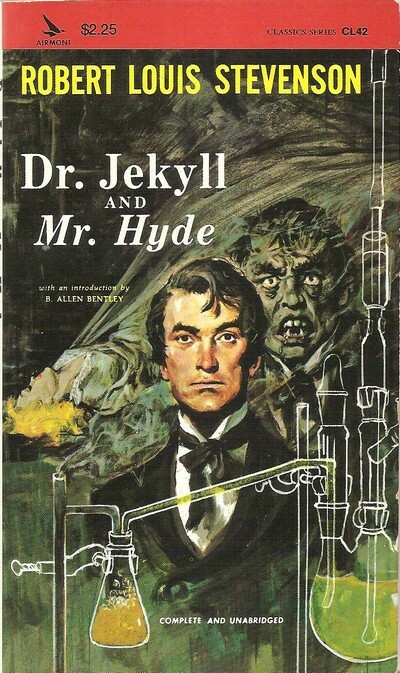 The characters in Dr. Jekyll and Mr. Hyde don’t live on the page like that: Hyde is described as evil, but he isn’t frightening like Blind Pew. Hyde is words on a page; Pew wrenches arms and skips nimbly from the parlour of the Admiral Benbow. His stick goes “tap-tapping” on a “frozen road”. He lives, and dies, before the mind’s eye. But one thing the characters of the two books have in common is that they’re almost all male. There’s a cook and a housemaid in Jekyll and Hyde, Jim’s mother and Silver’s “old Negress” in Treasure Island, and that’s it, unless you count the Hispaniola, Silver’s parrot and the sea. Lord Henry ponders the “subtle magic” of language and asks himself: “Was there anything so real as words?” Yes, I would say, and things more real too, but the attempted paradox is a reminder that Wilde is not striving for realism. I don’t think he could have achieved it as Stevenson could and often did. Stevenson was a better writer, but The Picture of Dorian Gray is a more fully realized book. It’s longer, after all. Dr. Jekyll and Mr. Hyde is as short as the dream or nightmare it resembles: it offers the ingredients for horror, but you have to cook some of them for yourself. Treasure Island isn’t a dream: it’s an aquarium or a magic mirror. All three are books to return to again and again over a lifetime, but for me Stevenson’s literary stature seems to grow, Wilde’s to shrink, each time I do so. He [William] was getting jolly hungry. It must be after lunch-time. But it would spoil it all to go home too early. Here he caught sight of a minute figure regarding him with a steady gaze and holding a paper bag in one hand. William stared down at him. “Wot you dressed up like that for?” said the apparition, with a touch of scorn in his voice. William looked down at his sacred uniform and scowled. “I’m a scout,” he said loftily. He opened the bag slightly and William caught sight of a crowd of wasps buzzing about inside the bag. He brought out a handful of snails from a miniature pocket, and put them on the ground. His voice was a scream of ecstasy. He took them up and returned them to their pocket. From another he drew out a wriggling mass. William roused himself from his bewilderment. “How — how do you catch ’em?” he said. A wasp settled near him, and very neatly the young naturalist picked him up and put him in his paper prison. “Now you get one,” he ordered William. William determined not to be outshone by this minute but dauntless stranger. As a wasp obligingly settled on a flower near him, he put out his hand, only to withdraw it with a yell of pain and apply it to his mouth. Thomas emitted a peal of laughter. …a light as at some happy memory came into its face. It pulled up the butter muslin to its waist, revealing muddy boots, muddy legs and muddy trousers, plunged its hand into its pocket and brought out a nut, which it proceeded to crack with much facial contortion and bared teeth. Violet Elizabeth dried her tears. She saw that they were useless and she did not believe in wasting her effects. More than once William had seen the small but redoubtable lady fulfil this threat quite literally. He watched her with fearsome awe. Violet Elizabeth with a look of fiendish determination on her angelic face opened her small mouth. The domineering William much prefers the demure and dimpled Joan, who’s happy to let him control events. “The Mammoth Circus” he arranges to welcome her home in this book succeeds in introducing more chaos into the adult world. He hides its star performers in the apparently empty Rose Mount School and they end up driving out the foolish and credulous women who have flocked there to a convention of the Society for the Study of Psychical Philosophy. 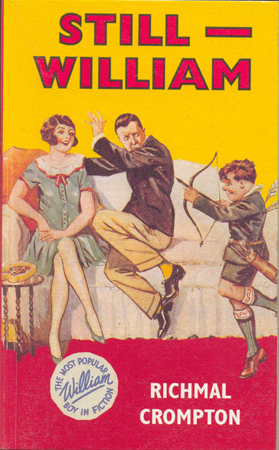 Crompton often uses William like that to deflate pretentious, superstitious and self-important adults. Later in the book he’s mistaken for a musical prodigy and produces a “Bacchanalian riot of inharmonious sounds” on the Vicarage piano, which the wives of the vicar and squire compete to praise. Bacchanalian is the mot juste: the eternally youthful William, eleven both when the series began in 1921 and when it ended in 1970, introduces the drunkenness of the irrational and unplanned into middle-class adult sobriety, as some of Saki’s anti-heroes do. Crompton doesn’t have all of Saki’s subtlety or much of his malice, but in her way she’s rebelling against the same conformity and rigidity, while recognizing that rebellion has its own flaws. That’s William in trouble again.